Philips Screeneo 2.0 review | What Hi-Fi? Take one look at the Philips Screeneo 2.0 and you may feel the urge to feed it your archived bills. With the appearance of a paper shredder, it hardly resembles the typical projector that passes through our test room doors. However, it does look similar to the original Philips Screeneo that we awarded four stars last year – just wider, shorter and more lunchbox-like. The Screeneo 2.0, just like its predecessor, is an ultra show-throw 3D DLP projector, designed to sit close to a wall or screen, and compact and portable enough to carry from house to house or room to room. Want to outdo your mate’s 40in telly to watch Premier League football or supersize your movies to 120 inches without the cumbersome process of setting up a dedicated projector? The Philips Screeneo 2.0 is worth considering. Aside from the fact it gives you a bigger screen than the original Screeneo’s maximum 100in, the headline news is that it’s Full HD (1920 x 1080) instead of 1280 x 800 resolution. That means native playback of HD channels, Blu-rays and PS4 (£280) games, no downscaling necessary. Contrast ratio is also up from 100,000:1 to 200,000:1, but the Philips is not quite the gift that keeps on giving. It’s less multimedia-focused than the older Screeneo, leaving TV tuner and network streaming duties to your Blu-ray player or games console, and settling for just aptX Bluetooth functionality this time. There’s still clearly a place for both, so it makes sense that the Screeneo 2.0 is an addition to the line-up rather than a replacement. MORE: PS4 vs Xbox One: which is best? Differing priorities cause some discrepancies with connectivity – there’s no SD card on the new Screeneo, for example – but the main ones are out in force: three HDMI (two at the back and one on a side panel) and single USB, VGA, composite and analogue audio inputs. Not forgetting optical and headphone outputs. With a 0.21:1 throw ratio, the Screeneo 2.0 is capable of projecting the maximum 120in image from a distance of 42cm, or a 50in one from 10cm – front, rear or ceiling-facing. You’ll no doubt get the best results beaming to a dedicated screen, although technically any patch of plain wall will do. You don’t need to paint your living room wall either, as a wall colour correction setting can change the colour balance for white, beige, grey or green walls accordingly. Keystone adjustment can also be found in the menus and operated by the remote, while focus is electrically adjusted on the unit itself. Wondering where the lens is? The most accident-prone way to find out is to turn on the unit, peer over it and get an eyeful, as it beams up through a window on the top panel. You have been warned! The Screeneo has 2000 lumens to its name, which means you get a picture that is reasonably bright. That’s not to say brightness levels should be whacked up without a moment’s thought – there’s a balance to be struck with contrast and especially black levels. Achieving that takes a bit of picture tweaking in the menus, even after you’ve run the THX Optimizer disc through it. The Flow Motion processing comes in handy to iron out the out-of-the-box judder during camera pans. We play Guardians Of The Galaxy on Blu-ray, and when it all kicks off in the prison, the Flow Motion helps with the slight instability that otherwise taints the action scene. Colours are strong but not too saturated. Yondu’s blue face and Gamora’s green skin have punch, and are delivered on a rich, but still pleasing, palette. You shouldn’t expect the same crispness, subtlety or detail levels of a good dedicated home cinema projector of this price, but it looks far from soft or washed out and, easy on the eyes, is generally a comfortable, compelling watch. DVD performance is good too, the drop in resolution not necessarily obvious on first glance. Noise is kept to a minimum and colours remain solid. Sound, typically, isn’t much of an area for contention with projectors. But this, as we’ve discovered, isn’t just any projector. 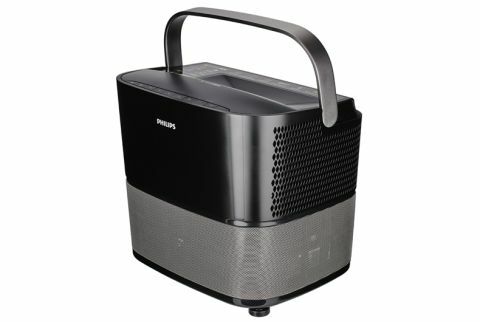 Determined to stand on its own four feet and not rely on an external sound system, the Philips has 2.1-channel built-in speakers. Powered by 26W of amplification, they sound surprisingly capable. They deliver the Guardians of the Galaxy soundtrack’s 80s pop tunes with gusto and clarity, and not only go loud enough for dialogue to be heard from across a room but have the insight to communicate Rocket’s sarcastic quips and Groot’s deep gruffness too. Despite the Screeneo’s proportions, bass isn’t completely absent either. It’s a balanced and entertaining sonic presentation, making its Bluetooth audio functionality more than worthwhile. CD-quality streams from a smartphone come through clearly with good detail, and are energetic enough to get your toes twitching. Philips has plucked the neat concept of a portable all-in-one projector out of nowhere and executed it brilliantly. The Screeneo 2.0 may not be ideal for home cinema purists after the best picture, but as a convenient projector, it’s a success.